"How did you do it?" asks one of my aunts, wanting advice. It is 2003 / I am 15 / 5 feet 8 inches / 144 pounds. I mumble something about diet and exercise, instead of: I skip breakfast. I eat one apple for lunch. I guzzle water instead of eating, drag the same Poland Spring water bottle around with me wherever I go, despair when I lose it. I obsess over the calorie content of my food without actually looking it up, because I am too afraid to know. Instead, I make it up, overestimating. I exercise every night to the same hour-long DVD, in front of the wide window in our living room, in front of my father, who likes to stand by and watch for a few minutes (me? the DVD?). I know I'm making him proud by making myself smaller. In 2016, I am a full inch taller, and my doctor suggests that 145 pounds would be a "healthy weight" for me to aim at. The first time that I remember being weighed at a doctor's office, the scale hits 103. This is not good, it is proposed to me, still in elementary school. My mother takes me shopping for pants later that day, bringing me pairs that are too small, in the sizes she had assumed I was. One after another, they stop at my thighs. She wrinkles her nose and sighs. "I just didn't realize you were that big." At age 4 or 5, my mother and Bubbe take my sister and I to a diner. They order my sister a milkshake, which she doesn't want. I ask for one and am refused, told that I don't need it. Everyone on my DVD is muscular and energetic. They sweat all over the place, just like me. I get used to the rhythm of the music, the places where the song changes, where someone coughs, where the trainer makes the same joke every night. I know without looking when he'll change sides, kick backward, shake his head just so. At a family dinner, I am casually referred to as the garbage disposal. I sob and sob and sob in the car outside the gym because I have gained 10 pounds. I don't know, at this point, that I have also gotten taller. I just know I've done something bad. I am taken to a doctor who lets me know I should work out every day for at least 60 minutes and eat a lot less / that should do it! That should take care of me. In 2016 I can benchpress 120 pounds and I am finally starting to appreciate what my body can do, instead of the things it can't. I run around the block for as long as I can stand it, longer—I don't stop until I place my hand on my stomach and it feels cold to the touch. I read a book about a teenager who takes a summer job as a gardener and loses weight, and I hope it might happen to me. I read a book about a woman who becomes depressed and takes long, numb walks and loses weight, and I hope it might happen to me. I read a book about teens who take up running, one of whom becomes anorexic and loses weight, and I hope it might happen to me. It does. In a dance class in college, I smile and say something about being larger than the other students in the class—this is an easy thing to make a joke about. My teacher looks right back at me: "No, you're stronger, and that's a good thing." I'm a little confused, because this is not how the conversation has traditionally gone. In 2016, I can load 225 pounds onto a metal barbell and place the barbell across my shoulders and squat down and stand up. A woman in my gym class talks about her 1300-calorie daily limit, and I start to wonder if I should limit myself in this way again. I faint. Someone tells me it must be the heat / I agree / my stomach is also empty. My mother tricks me into joining a swim team, though I have expressed no interest in swimming. A few years later, my mother tricks me into joining the intensive summer training camp for middle school soccer players who are transitioning to the high school team, though I have never played soccer. I try not to talk about weight or diet in front of other people, because I have been the person listening, and I fail, over and over. I am a good listener, but I've been listening to the wrong narrative. When I explain to my doctor that 145 pounds would not be healthy for me, that I have only ever achieved that weight through disordered eating, that the number that appears on the scale is not inherently healthy or unhealthy and that the way we talk about weight and health should be carefully considered, she writes back: "OK"
Okay—I have never been satisfied. I have been told I should never be satisfied. I have been taught to love food, and to deny it. All descriptions of me as a baby are accompanied by descriptions of my weight. How it hurt to carry me around. One of the rituals that I perform almost daily is the ritual of the gym. I wake up every morning at 5:25am, whether going to the gym or not (because my cat has set his internal breakfast clock to 5:25am). Most mornings, I walk a few blocks over and lift heavy weights / throw weighted balls / attempt handstands / do burpees / jump onto boxes / run up and down a 100-meter 35-degree ramp. I do this because I enjoy it. I love the ritual of approaching the bar, checking my stance, ducking my head under and resting the weight across my shoulders. Feeling the long muscles of my thighs activate as I allow the bar to press my body down into a squat, then reversing upwards—straightening out like a problem has been solved. It's very form-driven, weightlifting, and that is the part that keeps me coming back. The way it feels to do a thing correctly. A clean and jerk works because of the angle of your body as you bend down to pull the bar. How the body is oriented in space matters, and as I think back to activities of the body that I have loved, I see they have all been driven by form: weightlifting, modern dance, horseback riding, discus, writing. In each of these, there is a feeling of right-ness driven by form. Form in writing is something that I feel just as viscerally as the arc of my arm traveling forward through the discus circle / following the twist in my body as my weight shifts from my back foot to my front foot / my brain orients / to the page. So the body, too, is always in the page / just as much a plane as any other. Those lines are from a poem I wrote 6 years ago, the first thing I ever wrote that splashed out over the page. I wrote it to be a jerk, because it was for a class, and I knew my professor would hate it. At the time, I wasn't convinced by projective verse and white space, either, and then I was surprised by how excited I was to shape the page, to scatter the words like pollen and gather them into a thick layer at the bottom. Reading it back, I don't find it that exciting anymore, but it's funny to see how many self-discoveries I made because I wanted to write the thing that I wasn't supposed to write. How many decisions made in negation, against, in preposition. I have always liked the swinging door of the word "against"—which is anti-, pushing, but also the pairing of one long body next to another. Day four is hard. As someone whose forthcoming book title contains the word “body,” I have some anxiety about including that term in the book’s announcement of itself, even though the word occurs throughout the text anyway, and even though it’s a large part of the book’s concern. I worry because there are so many poetry books and poems about the body, and I hesitate to follow a trend for trend’s sake. But I wrote the book the way that I wrote it because of itself, and not to be part of a moment, so I kept the title (and, let’s be real, I also kept writing about the body and using the word body, because I am trying to cultivate an attitude of fearlessness when it comes to content and form). But I was thinking about this again today—why do so many poets think so often of the body? I mean, I find it infinitely interesting, surreal, difficult, unbelievable, ridiculous, etc. so I can’t blame anyone else for thinking the same. When I say "the body" I don't even necessarily mean a human body, and certainly not an idealized body, but the materiality of containment. Perhaps it's not that poets are into the body, but that writers interested in the body are drawn to poetry because it is inherently concerned with form. If the body is difficult to define, so is poetic form. For me, form can invoke the multiple and the simultaneous, as well as the specific and singular. Not only is it a constant morphing, but it also draws attention to itself in that way. Even a poem that doesn’t step outside of accepted forms asks you to pay attention to the way it appears in the world, just by declaring itself a poem. And that’s what I can’t get over—the way we appear in the world. The way bodies are multiple and simultaneous and overlapping, if you pay attention. I'm embarrassed to say it's taken me this long to read Beloved. I feel like an idiot about it. What is there to say but that it is beautiful and drowning? 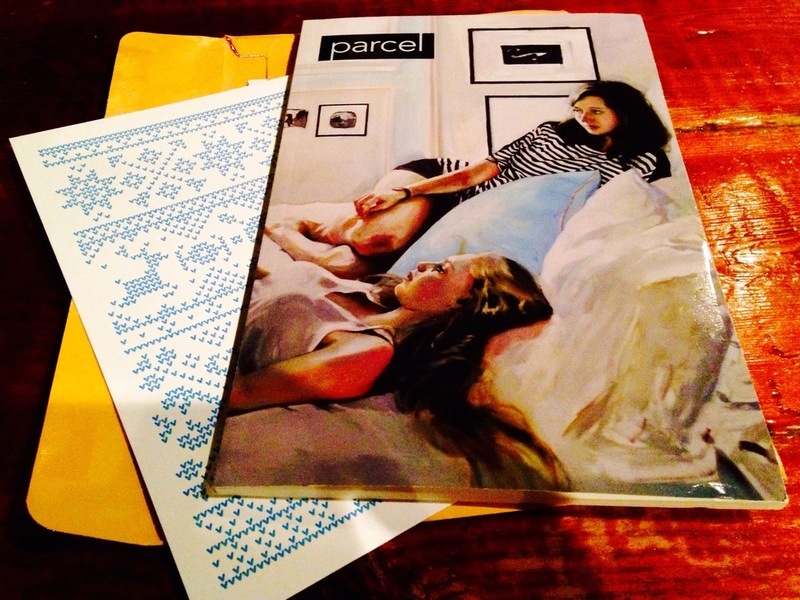 My contributor copy of Parcel jst came in the mail, and I'm pretty excited to read it. The magazine is run by two Bama CFAs, which is cool, but it's also a carefully curated journal and I'm into that. "Golem" is one of the pieces of Doors of New Jersey that speaks most to questions of distance and proxy and fault. I started reading an epistemology text and now I am just sitting around thinking about indirect realism and how one's own body is an external world. Poems from The Bone and the Body appeared in Tarpaulin Sky Magazine today. I am pretty happy about it (is an understatement). I've been focused on Doors of New Jersey for the past year, so it's nice to return to the rhythm of these prose poems. This voice and these beachscapes still matter, still echo. let myself cry hard jogging the Barrio.